If you’re running one of the approximately 140 working refineries in the United States, the last thing you need is an unplanned shutdown. But a production standstill is exactly what is at risk if you don’t keep an eye on the viscosity of the lubricating oil used in any of the rotary compressors in the plant, with the highest risk of these being the gas compressors. One minute all processes are up and running, and the next there’s a bearing failure and production stops. It’s not just the cost of lost production either. A compressor failure in a single part of the refinery can cost tens of thousands of dollars a day in lost revenue, with similar amounts to rebuild a compressor, and hundreds of thousands of dollars for a replacement. There’s also the cost of maintaining spares. Clearly managing lubricant viscosity is critical to maintaining compressor health, but it is a common practice to monitor lubricant viscosity in each major compressor once a month by sending a sample to a lab for testing. For compressors where lubricant comes in contact with methane and other light hydrocarbon gases, the lubricant’s viscosity can break down much more quickly, increasing the risk of failure. 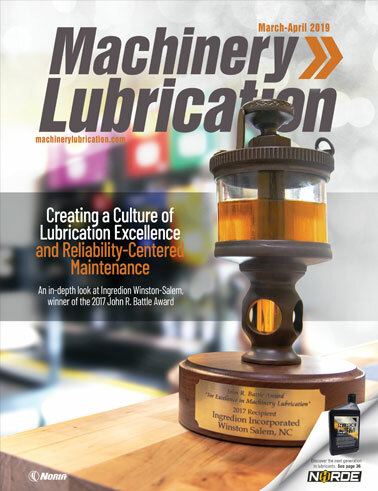 Through hard luck, refiners also have found that real-time temperature monitoring is inadequate to monitor lubricant viscosity. A major Gulf Coast refinery claims it has solved the problem by moving to real-time monitoring of lube oil viscosity in critical compressors. The true measure of the health of a lubricant’s viscosity can only be gauged when measured in its natural position with gas vapors dissolved in the lubricant. In addition, monitoring lubricant temperature isn’t sufficient to protect compressor bearings, especially in applications where process starts and stops can occur. What’s needed is in-line viscosity monitoring to help provide plant operators with real-time data on lubricant viscosity. There is a solution for refinery managers working to keep plants online and producing. New, inexpensive and rugged in-line viscometers are able to monitor real-time changes in lubricant viscosity, offering a cost-effective way to keep track of compressor health in real time. Rotary compressors are used throughout oil refineries in applications ranging from vapor recovery to gas-processing operations. Screw and scroll compressors make up a significant portion of this equipment. Screw compressors use two reciprocal screws to compress gases. 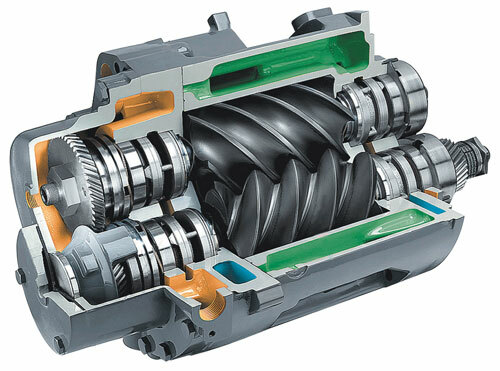 Gas is fed into the compressor by suction and moved through the threads by the rotating screws. Compression takes place as the clearance between the threads decreases, forcing the compressed gas to exit at the end of the screws. Scroll compressors, often known as spiral compressors, use two interleaved spiral vanes to move and compress fluids and gases. Typically found in intermediate and end-product applications, scroll compressors are valued for their reliability and smooth operation. In both types of compressors, lube oil is used to seal the compressor from gas leaks, lubricate moving parts and manage temperature during operation. The condition of lubricant oil is a critical factor in extending a compressor’s bearing life and overall reliability. Monitoring and managing lubricant viscosity can prevent costly breakdowns due to bearing failure. Viscosity also plays a role in energy efficiency, as demand for more efficient compressors is driving the use of lower-viscosity lubricants. A range of lube oils, typically synthetic in composition, is available for use in compressors. Water resistance, thermal stability, long life, resistance to oxidation and resistance to absorption of process gases are all important characteristics. While the goal is a lubricant with a long and useful life, harsh environments, contaminants and even humidity in the refinery’s external environment can greatly reduce lube oil’s useable lifespan. Monitoring lube oil viscosity is the best way to prevent bearing wear and compressor failure. While some plants may monitor as infrequently as once a month, rapid changes in viscosity occur, and the results can be severe. Compressor lube oils are formulated to work well and remain stable at high temperatures and pressures. Hydro-treated mineral oils are used for their low gas solubility (1 to 5 percent). Synthetic compressor lubricants are used depending on the process and how much gas dilution is present. PAO (Polyalphaolefin) oils, for example, have excellent water and oxidation resistance. PAG (Polyalkaline Glycol) oils, which do not readily absorb gases, are used in applications where process gases are compressed. Many factors can affect lube oil viscosity. These include oxidation, dilution, contamination, bubbles and temperature changes. Oxidation occurs when churning lube oil foams, exposing more oil to surface air and causing oxidation that lowers viscosity and threatens useful lubricant life. Dilution is the result when lubricant oil is diluted with gas such as methane, dropping viscosity. Bubbles form as foaming oil churns against the screws or vanes of the compressor, instantly dropping the viscosity of the oil. In contamination, vapors from hydrocarbons being processed can mix with lube oil. This light hydrocarbon and methane contamination – sometimes called “a witches’ brew” – makes measuring viscosity challenging. Significant changes in temperature can occur – typically at start-up – that affect the viscosity of the underlying lube oil as well as any contaminants, further aggravating the situation. A range of compressor failures can result. Bearings, both rotary and thrust, can fail, which in turn cause wear on the rotor assembly. Replacing bearings is less costly than a total rebuild or replacement. Either way, the plant faces downtime. The unpredictability of viscosity changes means monthly checks are not enough to prevent bearing failure and subsequent plant downtime. Some compressor customers are designing in-line viscometers into compressors to monitor real-time viscosity changes that happen between standard oil lab analyses, viewing this “preventative” approach as an ideal way to ensure bearing life and minimize the costs associated with unscheduled downtime. Not all process viscometers are created equal. Several instruments employ an innovative sensor technology that uses an oscillating piston and electromagnetic sensors. Other process viscometer technology approaches include falling piston, falling sphere, glass-capillary, U-tube and vibration designs. 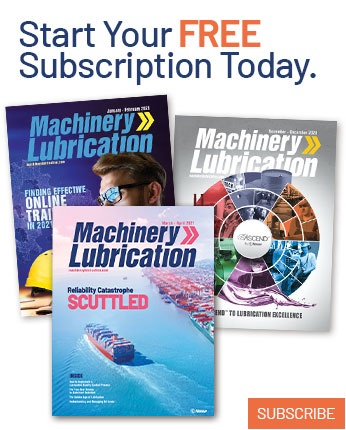 In all cases, plant managers should look for certain characteristics for in-line lubricant viscosity measurement, such as menu-driven electronic controls, self-cleaning sensors, built-in temperature detection, multiple output signals, automatic viscosity control, data logging, quick-change memory settings, security and alerts. Menu-driven electronic controls can be powerful and easy to use, while a self-cleaning sensor uses the in-line fluid to clean the sensor as it is taking measurements to reduce unscheduled maintenance. With built-in temperature detection, the sensor should show temperature as an analog reading. For automatic viscosity control, look for a sensor that is pre-set but reconfigurable. The sensor should be able to “learn” how much control is needed for each fluid setting. Security and alerts are designed to prevent unauthorized changes and sound an alarm when set points are reached so operators can take action quickly. With multiple output signals, the sensors should display temperature and temperature-compensated viscosity readings. For process lines that run more than one fluid, quick-change memory settings simplify the process of changing settings. In data logging, the date and time code should be automatically logged, creating an audit trail and simplifying performance and quality-trend measurement. Robert Kasameyer is the president and CEO of Cambridge Viscosity Inc., a global leader in fluid viscosity measurement. The company’s major applications include life sciences and pharmaceuticals as well as oil and gas exploration, oil analysis, chemical processing and coating. Kasameyer holds a BSME from Tufts University and an MBA from Harvard University. Can Transmission Fluid Replace Compressor Oil?